A group of ecologists at Kew Gardens in London are testing a miniscule new tracker designed to monitor the behavior of bees. The trackers are made from off-the-shelf technology initially designed to track pallets in a warehouse, said the tracker’s designer, Mark O’Neill. Information from the trackers is transmitted back to computers, which log the readings. To attach the tiny monitors to the insects, the bees must first be chilled so they are less aggressive. They still make “a hell of a noise,” O’Neill said. The minute pieces of technology are just 8mm high and 4.8mm wide and are stuck to the insects with a type of superglue. O’Neill told the BBC the trackers would remain stuck to the bees for the duration of their expected lifespan – around three months. He added that they were attached to the bees at their center of gravity so they would not affect their flight. They have only been fitted to worker bees, which do not mate. “If an animal ate one, I guess it would have a tracker in its stomach,” O'Neill said. The tracker itself is made of a radio frequency identification (RFID) chip and an aerial especially designed by O’Neill to be lighter than other insect trackers, allowing the bees to fly further afield. “The first stage was to make very raw pre-production tags using components I could easily buy,” he said. “I want to make optimized aerial components which would be a lot smaller. I've made about 50 so far. I've soldered them all on my desk – it feels like surgery,” he added. He said the average flight time of a worker bee is roughly 20 minutes, meaning they have a potential “foraging” range of 1 kilometer. His plan is to have readers planted around the hive and flower beds to track the bees’ signals. “These tags are a big step forward in radio technology and no one has a decent medium to long range tag yet that is suitable for flying on small insects,” she said. 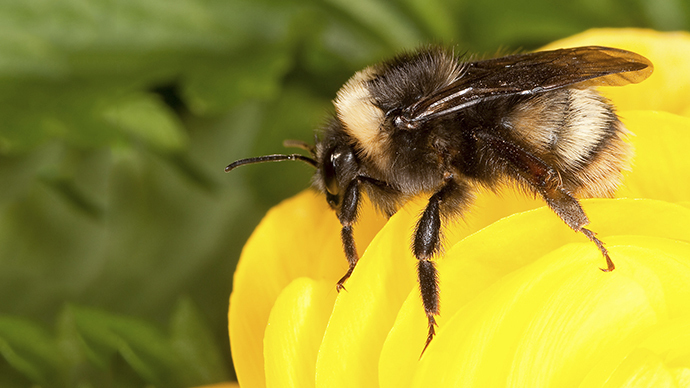 “This new technology will open up possibilities for scientists to track bees in the landscape. “This piece of the puzzle, of bee behavior, is absolutely vital if we are to understand better why our bees are struggling and how we can reverse their decline,” she said.